Crockmore can be easily approached from the carpark at Loughsalt (122262 I). A morning climb on Loughsalt Mtn left ample time to explore Crockmore and other hills in Donegal. It was a very foggy morning and i dropped straight off the back of the carpark - Lough Greenan soon came into view several hundred feet below. There is an old disused track heading down which explained the surreal appearance of large pieces of furniture in the middle of nowhere. On reaching the shores of the lough i tracked its edge towards the road and pumping station seen in the picture. This was a nightmare of really rough ground and all sorts of vegetation which seemed to go on forever - a really good clue as to a bad route - the advice is do not go this way unless you like a bit of punishment! Reach the road (approx 113260 J) at the small pumping house - this could be another alternative starting point with plenty of parking and a decent road. Cross road and head up the lower slopes of Crockmore. A sheeptrack (which has also seen a few bootprints) heads straight up to the first height which has a number of rocky outcrops at 307 m (. From here there is a clear view of the top as drop and then climb to the top. Pretty straightforward and the last of the mist was clearing as i made my way up allowing fantastic views. The summit has the little stone perched which can be seen in Simon's photo. Views north were dominated by the waters of Glen Lough and the Atlantic as it met the sweeping strandsin Sheephaven Bay. The old stone pillars of the railway viaduct which crossed the Owencarrow river are also clearly visible. To the west the clear autumn day brought Muckish, Aglas and Errigal close- as the eye roamed south the Bluestacks were not hard to miss. Looking back to whence i had come i could see my car perched high in the carpark next to a still mist enveloped Loughsalt. Noise was coming from the big working quarry on the southern flank of Loughsalt. On the descent i did not return to the height of 307m but easily contoured down the south side to the road. The clear weather now showed the preferred route back (and there!) 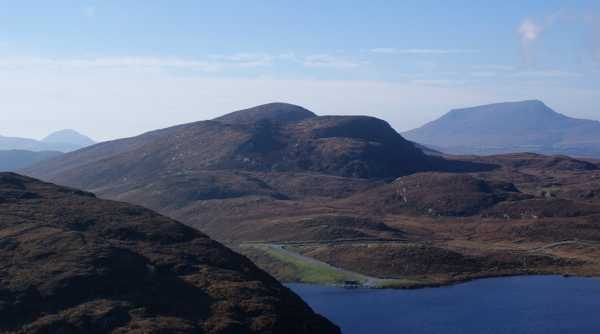 which was to climb to the heights above Lough Greenan to follow the ridge which leads back to the carpark at Loughsalt. This was great walking with views over a wide area of Donegal.